A deposit of $1,500.00 (fully refundable) is required with a completed Online Camper Application. There is a Full Season siblings discount of $400.00, and a Half Season siblings discount of $200.00. There is an alumni discount of $500.00. First Session campers may elect to remain at camp for the Second Session if space is available, at normal Full Season rates. All fees are payable in U.S. funds only. 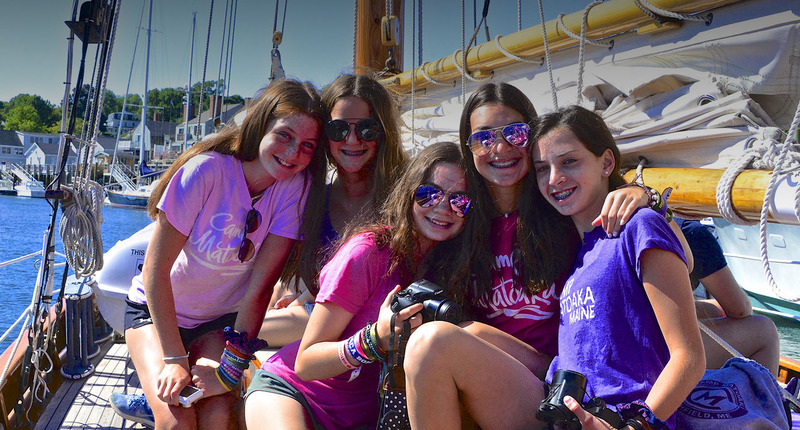 Camp Matoaka provides ground transportation, for a nominal fee, from the Boston Logan and Portland Airports, as well as New Rochelle, New York, Fairfield and Hartford, Connecticut and Needham, Massachusetts. Chaperoned group flights are provided from New York, Philadelphia, Baltimore, Washington, DC, Atlanta, Miami, Ft. Lauderdale, San Francisco and Los Angeles. Diane Doucette, from Atlas Travel, is Matoaka’s official camp travel agent. She can be reached at 508-488-1193 and can help arrange all air travel. Camp Baggage is our official luggage carrier and can be reached at 561-748-5185. All luggage must arrive at camp one week prior to your daughter’s arrival. Campers sometimes want extra money when they go out of camp on trips. For example, they may want to buy souvenirs or mementos on that special trip to Bar Harbor. For these purchases, we include in your invoice a $150 fee for a Half Session Camper and a $250 fee for a Full Session Camper for all off-campus trips. The camp provides, at no extra charge, weekly laundry service for the campers. Each camper’s laundry is washed individually and returned the next day, clean and folded. Private tennis lessons offer individualized attention to help your daughter achieve her tennis goals and reach her maximum potential. Campers work with nationally-ranked college and professional tennis players on one of our nine tennis courts. Private lessons are offered for $45/session. Campers should be comfortable and ready to play at all times. They are encouraged to show their Matoaka spirit throughout the summer on Matoaka Mondays and should wear Matoaka clothing whenever they are out of camp. Matoaka clothing and other amenities are available from The Camp Spot, our official camp outfitter. A catalog is sent to our camp families in January. The Camp Spot can be reached at (800) 705-2267 or by visiting their website. Horseback Riding (English) lessons are offered either 3 times per week or 6 times per week. Our experienced riding instructors work with campers at any level on equitation skills. Lesson themes vary from walk-trot drills to advanced competitive jumping. Every camper involved in the Riding Program also receives a light horse management course in addition to her in-saddle instruction. Full Session Riding = $1000; Half Session Riding = $650.